In spite of her enviable position as one of the planet’s reigning pop godesses, Caribbean beauty Rihanna was not on this year’s shortlist of overseas acts for an International Night at Reggae Sumfest, according to Summerfest Productions chairman, Robert Russell. 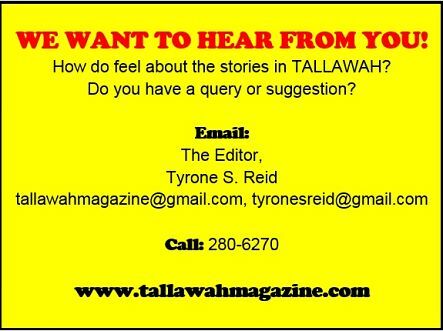 “Rihanna has been here before, so our focus was on getting performers we’ve never had on the show before,” Russell tells TALLAWAH at Wednesday’s star-studded launch at Devon House. The Bajan beauty was among a long wishlist of superstars many young Jamaicans were hoping to see live in concert at this year’s festival. And the same can be said of hip hop/R&B bad boys Trey Songz and Drake. Even so, with the big event more than three weeks away, it’s never too late to add some additional muscle to the lineup. 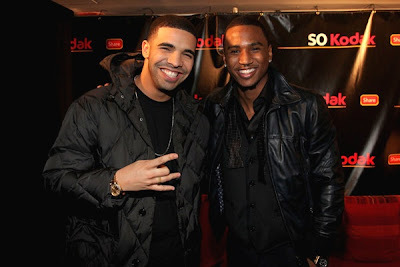 To this end, Russell revealed to TALLAWAH that Summerfest is still negotiating with the management of other international acts, including the handlers of Drake and Trey Songz. Indeed. But for the record, Mr. Russell, who we really want is Queen Beyonce. FIRST-HAND SOURCE: Russell speaks with Wealth TV's Cora. LADIES FIRST: On the scene with Curran, Sutherland and Grange. Word from sponsors and promoters: Brief video-enhanced messages came from Summerfest Productions’ Johnny Gourzong and Robert Russell; Red Stripe’s Safiya Cooper; Pepsi’s Carlo Redwood; and Digicel’s Shelly Curran. More famous faces in the crowd: Gyptian, Garth Walker, Kamal Bankay, Nadine Sutherland, Protoje, and culture minister Olivia ‘Babsy’ Grange. GLOW GIRL: RE TV's perennial cutie Candice Buchanan was there too. ALL IN THE DETAILS: Russell spoke with other members of the press, like ER's Anthony Miller. 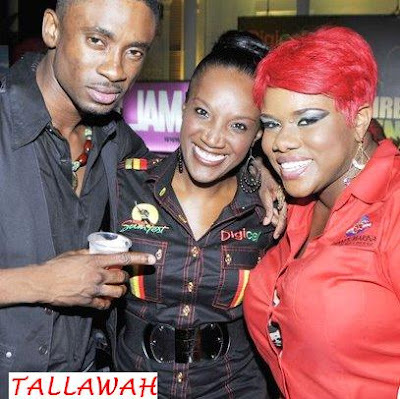 THREE'S COMPANY: Singer Chris Martin, Digicel's Paula Pinnock-McLeod and emcee Miss Kitty. 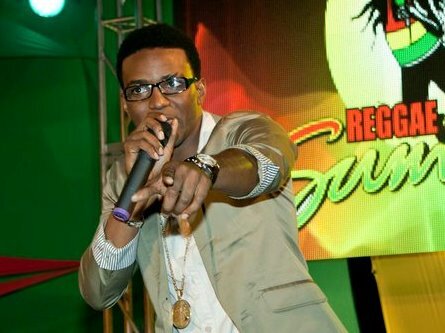 ON HIS MIND: Konshens comments on the current state of the music. 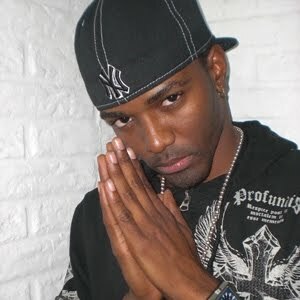 Over the course of his ever-expanding career, Konshens has rightfully earned critical acclaim and the respect of his audience and peers, primarily on the merit of his smart, largely introspective lyrics in songs that indisputably resonate across age and gender lines. A side effect of this newfound power, so to speak, is a surge in the entertainer’s outspoken nature. But history proves that his utterances are usually traceable back to his quest to make sense of a genre he cherishes – and wishes to see reach even greater heights. 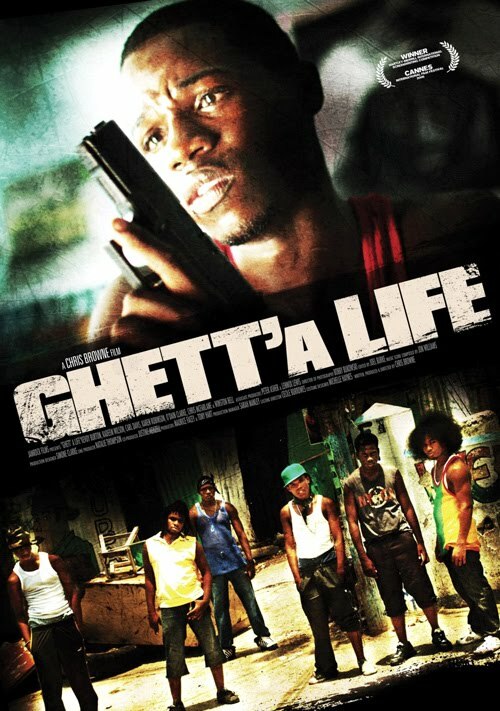 HARD-KNOCK LIFE: Crime and youthful ambition collide in Ghett'a Life. Ahead of the July 29 world premiere for Ghett’a Life, the film’s vibrant, crisp-looking trailer sheds some light on key plot points, chiefly the conundrum facing young Derek (newcomer Kevoy Burton), the fiercely driven central character with a dream of becoming a national boxing champ, much to the distress of his protective parents, in the face of the terrible struggles afforded by life in the ghetto. Elsewhere in the 3-minute clip, there’s a strong look at the the grip of two-party politics on the poor (sharing at least one thing in common with Storm Saulter’s Better Mus’ Come) and ruthless innercity donmanship, with Chris McFarlane appearing as a brutish gangster. And what of the rest of the film’s supporting cast? The trailer does reveal a host of familiar faces like Winston ‘Bello’ Bell (currently on stage in Stop Dat Train), Lenford Salmon and Teddy Price in smaller parts. In its exploration of everything from crime and family to the devastating effects of political tribalism on home, community and country, writer-director Chris Browne’s latest doesn’t sugarcoat the gripping violence that so often forms part of life in the downtrodden Jamaican innercity. 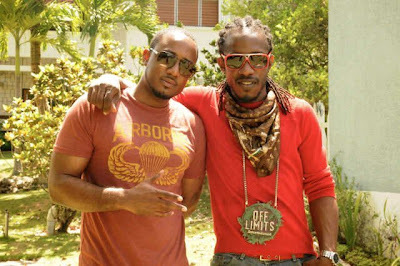 And while the notion of criminals (and politicians) wreaking havoc on the lives of civilians is hardly novel to Jamaican cinema, the decision by Browne (who previously handled bloodshed on screen with Third World Cop) to tell the story against the backdrop of competitive sports, youthful determination and teenage angst bears some degree of fresh, inspired originality. STATE MEN: PM Bruce Golding presents a little piece of Jamaica to outgoing Ambassador of the Federal Republic of Germany, Jurgen Engel, on Tuesday, June 28, at Jamaica House when Engel paid a courtesy call. 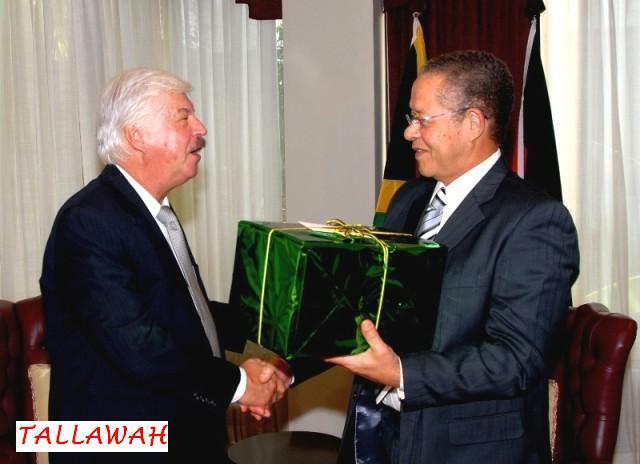 Golding told Engel that he believes investment is an area worth exploring between the two countries. 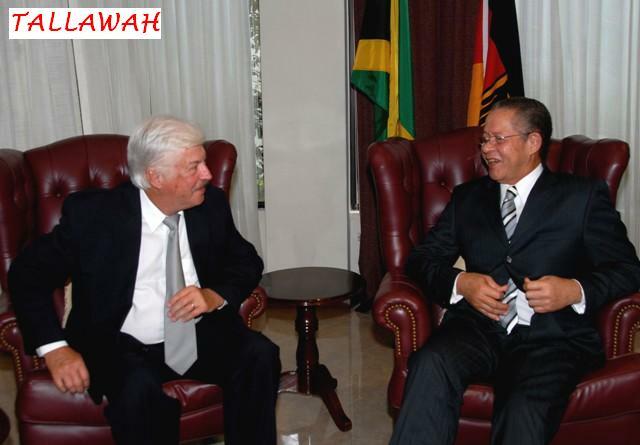 He further suggested that German investors attend a major investors' conference, which will be held in Jamaica in October. Golding also noted that the conference will accommodate leading investors from overseas and could assist with creating a new image for the country. 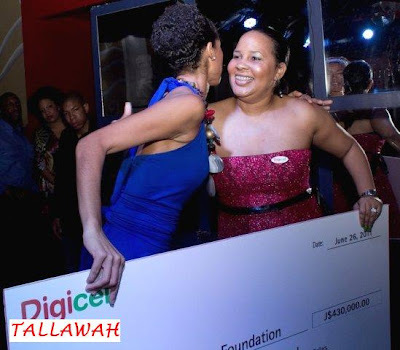 A BEAUTIFUL MIND: In the company of sponsors (like Digicel's Shelly Curran), entertainers (Tami Chynn hit the stage), good friends and general supporters, Yendi Phillipps hosted the official launch of her not-for-profit foundation Sunday evening at the Fiction club. Cheque presentations, a mini fashion show and an auction of some of Phillipps' pageant gowns were among the features at the event. The foundation has been established to support, among other things, health care provision and education for inner-city women. CRITIC’S NOTEBOOK: Does Chris McFarlane add anything substantial to 'Judgement'? CHARACTER STUDY: Tension envelopes Harris and McFarlane. It’s shaping up to be quite a villainous summer in the artistic life of Chris McFarlane. This season, the widely experienced actor is getting in touch with (and fully showcasing) his dark and menacing side – on the silver screen next month in Ghett’a Life, the gritty new Jamaican film from Chris Browne, and currently as the vengeful Richard/Antonio in the revived stage drama Judgement, stepping in for Andre Morris, who originated the role to critical acclaim. Morris’ performance signalled his long-in-coming arrival as a leading man of note. And it’s obviously a rewarding role because McFarlane, too, happens to fashion something impressive out of it. McFarlane, the older actor, lacks Morris’ effortless charm and Adonis-esque good looks, but the two-time Actor Boy winner brings an appealing maturity and self-assuredness to Richard/Antonio that Morris is yet to fully master. Still, both actors, playing opposite Deon Silvera and Dahlia Harris (the best friends Richard/Antonio comes between), manage to effectively convey the motivations and essentially the tics at the character’s core: a knack for unfeeling manipulation and a heart set on payback for what he conceives as an unforgettable, unforgivable wrong done to him. Deftly written and directed by Harris, Judgement (set in New York) naturally doesn’t feel as fresh as it did during its first incarnation at the Pantry last year, but do not intrepret that to mean that the play is waning in the bite or edginess that helped make it one of 2010’s best local offerings. Overall, Judgement remains a compelling hit, worthy of your dollars and two hours. Catch the drama and fireworks before the show closes for good at the Green Gables Theatre July 10. Tickets: 352-6180. BEY & BEYOND: Get in the groove with Beyoncé. It’s been a minute, but B season is upon us again. Beyoncé’s fourth album, aptly titled 4, may lack the scorching blitz of her past releases, especially 2009’s schizophrenic I Am…Sasha Fierce. But at 12 tracks (an additional three on the deluxe version), 4 still packs enough heat to last through winter’s chills. The album, admittedly more ballad-heavy, feels less mainstream R&B and pop and more eclectic, with generous shades of funk and gritty soul characterizing the largely radio-ready midtempo cuts. For the loyal Beyoncé-heads, though, it doesn’t really matter as Beyoncé’s work consistently conveys reservoirs of emotion and power that never fail to resonate. As it stands, 4 is a moody record with spurts of fiery energy that reaches a stunning crescendo on lead single “Run The World (Girls),” a ballsy salute to female empowerment. Other moments that lull the listener into a state of wistful tenderness include opening single “1+1,” an aching ballad about forging a real connection with that special somebody. For me, perhaps the most stunning (refreshingly so) thing about the new album is that Beyoncé doesn’t seem as preoccupied with a man who done her wrong as she’s been on her previous records. Yes, she does deliver the biting missive “Best Thing I Never Had” but more than anything the singer is undeniably in a joyful place – and with 16 Grammys, multiplatinum sales, and one of the industry’s most powerful men on her arm, isn’t that happiness understandable? The danceable, optimistic tracks like the Kanye West-produced “Party” (featuring clever rhymes from Andre 3000) and the groove-thang shaker “Love on Top” add tasty, if thoroughly energetic, variety. Ballads always get the A-grade treatment from Beyoncé, so it’s no surprise that ace songwriter Diane Warren’s singular contribution “I Was Here” boldly stands out in the disc’s second half as a soaring, anthemic meditation on legacy and respect, even in the face of its spare production. But if there’s another single that tops this one on the strength of sheer vocal dynamism and emotional heft, the unhinged, resilient track “I Care” attains that achievement. As for the CD’s deluxe version, the disco-flavoured, Prince-reminiscent “Schoolin’ Life” offers a proper lesson in how to make the old and new schools boogie together. EMPIRE STATE OF MIND: New York State Assemblyman Eric A. Stevenson, Lorna Golding (centre), Mount Vernon City Council President Karen Watts and Mayor Clinton I. 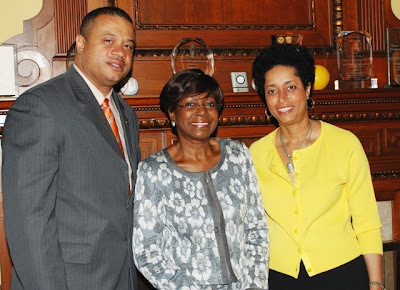 Young, Jr. share in a photograph during a reception held in honour of Mrs. Golding on June 18 at the Mount Vernon City Hall in New York. Mrs. Golding, who received the Key to City of Mount Vernon, visited the town to commemorate Caribbean American Heritage Month in Westchester County. 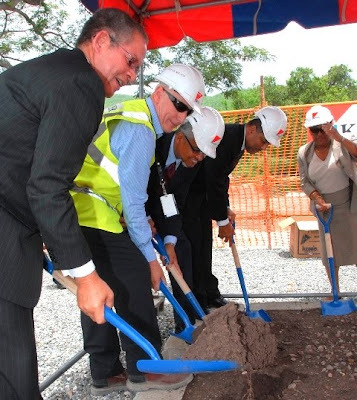 SOLID GROUND: PM Bruce Golding (left) breaks ground for the University of the West Indies (UWI) Vice Chancellery building on Friday, June 24. Golding said the establishment of the building is long overdue and is needed to further develop and coordinate the implementation of policies needed for planning and development of the university. Also participating in the ceremony: Caribbean Manager, Kier Construction Limited, Steve Milner; Vice Chancellor, UWI, Professsor Nigel Harris; Pro Vice Chancellor and Principal, Mona Campus, Professor Gordon Shirley; and Pro Vice Chancellor and Principal, UWI Open Campus, Dr. Hazel Simmons-McDonald. IT'S A DOGG'S LIFE: Of late, singer Cherine seems to have caught a thing for rappers. 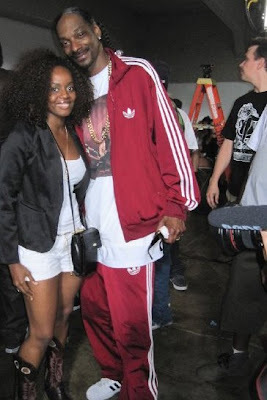 Recently seen in the company of Busta Rhymes in Miami, Cherine (one of the top local acts returning this year to Reggae Sumfest) was recently spotted on the set of the latest video by rapper Snoop Dogg in Los Angeles. Cherine will share billing on International Night II with Nicki Minaj, among many others. You know she's gonna bring it. ON SET: Fast establishing a name for himself in local entertainment circles, Washroom producer Conroy Forte (left) last week joined dancehall artiste Wayne Marshall on the Kingston set of the video for the summer hit "Swaggin'," which teams Marshall with Fambo and Tifa. DRINK TO THAT: Never a dull moment with Jamaican-born vocalist Mario Evon, who continues to work the scene while building a resume in the Big Apple. 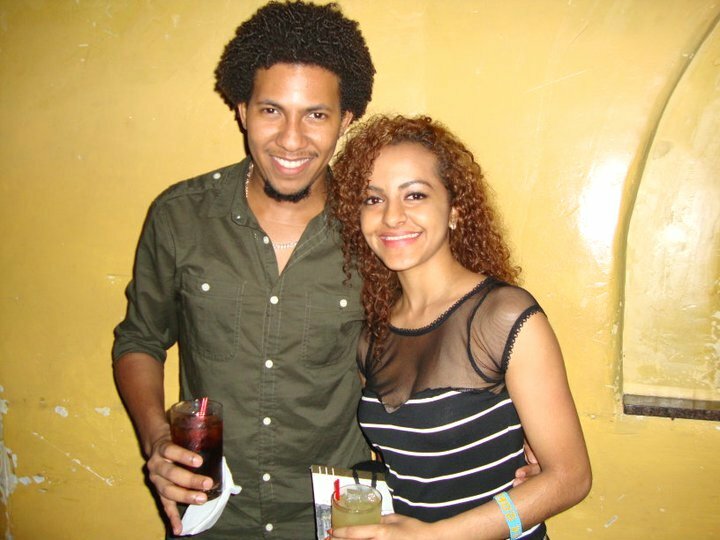 On the weekend, Evon (who has a debut album on the way) stepped out for the Soul of the City concert series with knockout girl pal Maritza Lord, who hails from Guyana. GOOD TIMES: Harris is the picture of happiness; her sparkling new white-gold-and-diamond ring. It’s a balmy Wednesday night in Kingston, and Dahlia Harris is hurrying home from the Judgement set at the Green Gables Theatre to catch the latest episode of Criminal Minds, the acclaimed CBS investigative drama starring Shemar Moore. For the uber-busy actress-turned-playwright-and-producer, having her fingers in as many pies as she does constantly keeps her on her toes, juggling multiple projects. So one can understand if her usually steady social life takes a beating now and again. As for her home life, that’s another matter. But one thing you can be sure of these days, when it comes to Harris’ love life, more than ever things are coming up roses, chiefly in the wake of --- signal the marching band! --- her recent engagement to her long-time beau. Of course, Harris declines to reveal his name or offer any clue that would make Mr. Loverman easy to identify (she’s hiding him from the press! ), but, as it should be, her life at this point is the definition of perfect bliss. Did I neglect to mention that the gigantic ring is an exquisitely crafted white-gold-and-diamonds work of art that dazzles on that special finger? STAGE ROYALTY: Harris photographs with Judgement co-star (and longtime pal) Chris McFarlane. The Gargamel waxes wise and philosophical on a track that packs muscle and influence with definite generational links. A gem. 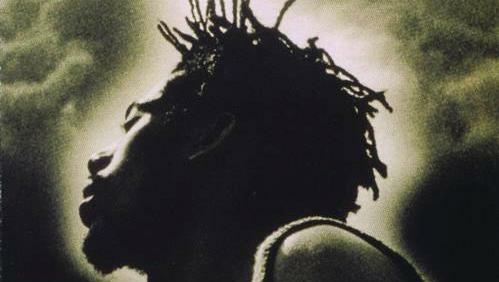 Unhurried and haunting, the definitive hit from the reggae legend, steeped in his heart and mind concerns for, what else, this circus called life. This is music as a force of will. At his vocally grittiest, the superstar is one with the kette drum (and vibrant African chants) on this beloved hit off 1995’s Til Shiloh, musing on Ethiopia and the never-ending quest for knowledge. Oozing a sensually low-key vibe as a man who wears his heart on his sleeve, Banton croons in typical baritone of his yearning for a “true love to comfort this heart of mine.” Now who can’t identify with that? WORLD WEARY: McCalla (centre), Maye and Salmon get in character. Sometimes in a film or a play a lead actor is so good that he (or she) makes the flaws in the rest of the work seem larger than they are. Nothing short of a testimony to their artistic gifts. Such is the case with Barbara McCalla in Stop Dat Train, the latest comedy-drama from writer Angie Binns, running at New Kingston’s Pantry Playhouse. McCalla, the best thing about the play, plays Franceta Jones, a heavy-hearted woman who makes a sudden return to the deep rural community she once lived after fleeing two years ago. Reuniting with daughter Gina (Zandriann Maye) at the family home and farm, Franceta catches the eye of farmhand Hawthorn (Winston Bell), with whom she begins a tentative romance. But Franceta is a woman with a past, harbouring a dark secret and, as she quickly learns, leaving the past behind isn’t necessarily the easiest feat to pull off. As played by McCalla, Franceta comes off as a brave, resilient woman who earns our sympathy. And, thankfully, the portrayal avoids any trace of showy emotionalism, in spite of Binns’ highly sensitive writing. Though lighthearted and sporadically humorous (as directed by David Tulloch) my big problem with Stop Dat Train is that for a family-centric comedy-drama, the characters are predominantly thin sketches with very little motivation or heartwarming appeal. Still, there’s no doubt that, for one, Franceta is a gratifying part to play and McCalla is radiant in the role. Bell has some fun playing Hawthorn, even if the dialogue makes him slip into clichés a bit too frequently for comfort. There’s a wan sub-plot involving Gina’s agoraphobia, a set-up that offers Maye a couple scene-stealing opportunities. The Pantomime Company’s Toni-Ann Fraser (as a jilted lover) and stage veteran Terri Salmon (as the nosy and quirky family friend Birdie) enjoy fleeting moments in the spotlight. FAMILY MATTERS: McCalla, Maye, Salmon and Bell share a scene.